AccuWeather headquarters in State College. Photo by Onward State. AccuWeather, Inc. is turning 50, and to celebrate, kicked off last week a year-long recognition of the company with a series of events, as well as retrospective stories and videos on AccuWeather.com. Founded in 1962 by Dr. Joel Myers, AccuWeather has grown from a weather company providing forecasts for businesses into an international weather media company that reaches more than half a billion users worldwide daily. Myers is the father of Dan Myers, publisher and owner of Lazerpro, the parent company of StateCollege.com. AccuWeather serves a worldwide audience from its headquarters in State College, Pa., and its Severe Weather Center in Wichita, KS, according to press release, and provides hourly forecasts for more than 2.7 million locations worldwide, reaching consumers via smart phones, tablets, free wired and mobile internet sites, and smart appliances, as well as via radio, television, and newspapers. Customized solutions to media, business, government, and institutions are also play a role in AccuWeather's services. Myers, AccuWeather's founder and president, is credited with many of the advances in the way consumers receive their weather information. "I was passionate about the weather at a very early age, and I also knew I would be able to combine my love of forecasting with a business that would save lives and help people know more about what the weather had in store for them on a daily basis," said Myers, the father of StateCollege.com Publisher Dan Myers. "We are constantly reinventing ourselves as technology changes how people access our accurate forecasts." AccuWeather became the first to introduce the seven-day, 10-day, 15-day hourly, and even the 25-day hourly forecast. AccuWeather retains patents for weather measures such as the RealFeel Temperature® – the only weather index to incorporate eight key variables to show what the temperature really feels like – as well as dozens of lifestyle forecasts, which show how the weather will affect travel, health, hobbies, sports and more, the press release said..
On the mobile and wired web, AccuWeather has built a comprehensive portfolio of partnerships with major digital equipment manufacturers worldwide, including Smart TV providers Panasonic, LG, Vizio, Sony, and Samsung and leading manufacturers of tablets and next-generation PCs, including Apple, Dell, Lenovo and others. AccuWeather's digital media has been recognized repeatedly. According to the press release, AccuWeather was selected by Apple for launch on the iPad, was the winner of the Best iPhone App at the 2012 Mobie Awards, and AccuWeather's Android applications are consistently chosen as top ranked apps by users. AccuWeather averages almost three billion data requests daily from internet-capable smart phones, tablets and appliances around the world. AccuWeather supplies weather content to hundreds of newspapers, including USA Today, The New York Times and The Wall Street Journal. AccuWeather's forecasts and content appear on over 72,000 third-party websites and its radio broadcasts are heard on nearly 750 stations. 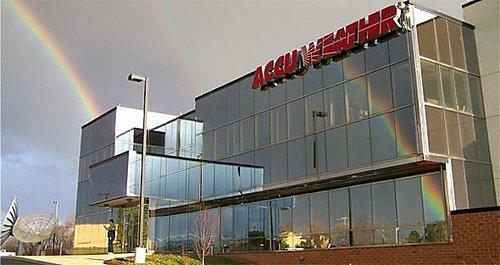 The 24x7 The AccuWeather Television Network is available to 38 million TV households in North America. Leadership at AccuWeather said they believe the next 50 years will produce even greater demand for its powerful blend of global reach, customized service and superior accuracy. "The discussion about climate change, and its causes and responses, will go on for decades," said Barry Myers, CEO of AccuWeather, Inc.
"Days after Superstorm Sandy, Governor Cuomo said, 'Anyone who says there is not a dramatic change in weather patterns is denying reality. We have a 100-year flood every two years now.' "
"As weather systems – from superstorms to droughts and snow – increasingly capture the headlines," said Myers, "the daily importance and value of AccuWeather will continue to grow." The Penn State women’s soccer team is one match shy of advancing to its first College Cup since 2005 after a victory over Michigan on penalty kicks Sunday night at Jeffrey Field.